CA Azur CD player security bolts, what fitting? Discussion in 'Hi-Fi Stereo Systems & Separates' started by Fulwood, Mar 10, 2013. Got a refurb CA Azur 340 CD player recently and the CD tray is refusing to open. So need to get inside, BUT lid held by 8 small security bolts which seem to have a hex/star fitting. Tried a small allen key but it has only allowed me to undo two loose bolts. The others are held too securely for me to undo. My question is what 'undoer' do I need - what is fitting please? Picture please. Probably a torx bolt, you'll need to buy the proper set of torx keys to get them off. Do they have a pin in the center of the fitting? Is it too late to send it back for a replacement? Even refurbs have guarantees. Torx bolt size 6. I suspect returning it is the better option though. No, as have a year's warranty, BUT cost of posting back to CA a lot more than 1 set of appropriate screwdrivers. Will post back if tray motor failed rather than just a drive belt. Having looked at pictures it's a small Torx bolt. Have ordered a set of 7 small Torx screwdrivers on line for £2.79 posted. Will unscrew and inspect as first option. 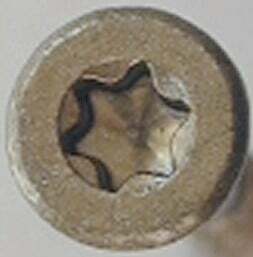 Note the pin in the center of the screw head. The most common type is the TORX, so you should be safe with TORX drivers. Thanks for the definitive answer, much appreciated! I can confirm that Cambridge Audio use standard Torx bolt heads. Torx screwdriver set came from Amazon this weekend and I got into the CD player very easily. I couldn't see any drivebelts so had a play with the connectors and found one on the front switch motherboard that needed pushing in firmly to make proper contact. Very glad to say that's done the trick and now the tray opens and shuts no problems! Thanks for all your help with this, problem now sorted. ..and again! Very useful, I hadn't thought of using Wiki to confirm what bit was needed for what head. Trying to educate the wife that amp+speakers are better than the speakers in the TV!